Taste test: These are supermarket-brand narrow-rippled potato chips. They're kind of greasy, but they're not bad chips. When it comes to dipping, they're just barely adequate. 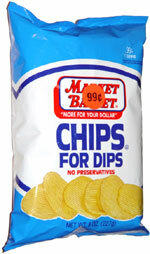 If you're careful and pick the right chip and hold it the right way, you can dip these without any breakage, but the narrow ripples really don't help the cause. You really need to get a chip with some good arch to it and hold it in the correct orientation to maximize the strength when dipping. Also, most of the chips in the bag were already broken, weakening their structural integrity further and further limiting the number of chips that have good potential as dippers. Smell test: Good regular potato chips smell. 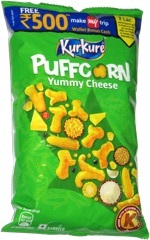 This snack was discovered by Keith at Market Basket. Review published .